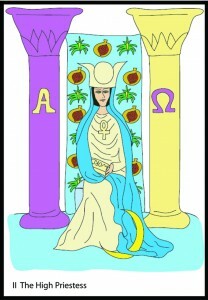 Years that add up to the #2 are represented by the High Priestess. Wisdom and refined receptivity define this year. It’s a quiet type of energy, not a time to make a scene. The High Priestess energy encourages you to quietly and carefully take note of everything around you. If you allow yourself to be sensitive to the subtlest of energies, you’ll notice what most of us miss. During this year you’ll likely exude a quiet patience and virtuous demeanor, setting you apart from the crowd. Others will find it intriguing. Your intuition is likely to be strong and there will be a tendency to use your feelings at least as much as your intellect when making decisions that matter. A wonderful gift of the High Priestess year is the ability to see the whole picture without getting swamped by the details. Strength and Judgement are the shadow symbols for the High Priestess.